"Mercury Messenger" redirects here. For the 2003 concept car, see Mercury Messenger (concept car). For other uses, see Messenger (disambiguation). Messenger (stylized as MESSENGER, a backronym for "MErcury Surface, Space ENvironment, GEochemistry, and Ranging"; the name is a reference to the messenger deity of the same name from Roman mythology) was a NASA robotic spacecraft that orbited the planet Mercury between 2011 and 2015. The probe was launched aboard a Delta II rocket in August 2004 to study Mercury's chemical composition, geology, and magnetic field. The instruments carried by MESSENGER were used on a complex series of flybys – the spacecraft flew by Earth once, Venus twice, and Mercury itself three times, allowing it to decelerate relative to Mercury using minimal fuel. During its first flyby of Mercury in January 2008, MESSENGER became the second mission after Mariner 10's 1975 flyby to reach Mercury. MESSENGER's formal data collection mission began on April 4, 2011. The primary mission was completed on March 17, 2012, having collected close to 100,000 images. MESSENGER achieved 100% mapping of Mercury on March 6, 2013, and completed its first year-long extended mission on March 17, 2013. MESSENGER's second extended mission lasted for over two years, but as its low orbit degraded, it required reboosts to avoid impact. It conducted its final reboost burns on October 24, 2014, and January 21, 2015, before crashing into Mercury on April 30, 2015. During its stay in Mercury orbit, MESSENGER's instruments yielded significant data, including a characterization of Mercury's magnetic field and the discovery of water ice at the planet's north pole, which had long been suspected on the basis of Earth-based radar data. In 1973, Mariner 10 was launched by NASA to make multiple flyby encounters of Venus and Mercury. Mariner 10 provided the first detailed data of Mercury, mapping 40–45% of the surface. Mariner 10's final flyby of Mercury occurred on March 16, 1975. No subsequent close-range observations of the planet would take place for more than 30 years. In 1998, a study detailed a proposed mission to send an orbiting spacecraft to Mercury, as the planet was at that point the least-explored of the inner planets. In the years following the Mariner 10 mission, subsequent mission proposals to revisit Mercury had appeared too costly, requiring large quantities of propellant and a heavy lift launch vehicle. Moreover, inserting a spacecraft into orbit around Mercury is difficult, because a probe approaching on a direct path from Earth would be accelerated by the Sun's gravity and pass Mercury far too quickly to orbit it. However, using a trajectory designed by Chen-wan Yen in 1985, the study showed it was possible to seek a Discovery-class mission by using multiple, consecutive gravity assist, 'swingby' maneuvers around Venus and Mercury, in combination with minor propulsive trajectory corrections, to gradually slow the spacecraft and thereby minimize propellant needs. to characterize the chemical composition of Mercury's surface. to study the planet's geologic history. to elucidate the nature of the global magnetic field (magnetosphere). to determine the size and state of the core. to determine the volatile inventory at the poles. to study the nature of Mercury's exosphere. The MESSENGER spacecraft was designed and built at the Johns Hopkins University Applied Physics Laboratory. Science operations were managed by Sean Solomon as principal investigator, and mission operations were also conducted at JHU/APL. The MESSENGER bus measured 1.85 meters (73 in) tall, 1.42 m (56 in) wide, and 1.27 m (50 in) deep. The bus was primarily constructed with four graphite fiber / cyanate ester composite panels that supported the propellant tanks, the large velocity adjust (LVA) thruster, attitude monitors and correction thrusters, the antennas, the instrument pallet, and a large ceramic-cloth sunshade, measuring 2.5 m (8.2 ft) tall and 2 m (6.6 ft) wide, for passive thermal control. At launch, the spacecraft weighed approximately 1,100 kilograms (2,400 lb) with its full load of propellant. MESSENGER's total mission cost, including the cost of the spacecraft's construction, was estimated at under US$450 million. Main propulsion was provided by the 645 N, 317 sec.Isp bipropellant (hydrazine and nitrogen tetroxide) large velocity assist (LVA) thruster. The model used was the LEROS 1b, developed and manufactured at AMPAC‐ISP's Westcott works, in the United Kingdom. The spacecraft was designed to carry 607.8 kilograms (1,340 lb) of propellant and helium pressurizer for the LVA. Four 22 N (4.9 lbf) monopropellant thrusters provided spacecraft steering during main thruster burns, and twelve 4.4 N (1.0 lbf) monopropellant thrusters were used for attitude control. For precision attitude control, a reaction wheel attitude control system was also included. Information for attitude control was provided by star trackers, an inertial measurement unit and six sun sensors. The probe included two small deep space transponders for communications with the Deep Space Network and three kinds of antennas: a high gain phased array whose main beam could be electronically steered in one plane, a medium-gain "fan-beam" antenna and a low gain horn with a broad pattern. The high gain antenna was used as transmit-only at 8.4 GHz, the medium-gain and low gain antennas transmit at 8.4 GHz and receive at 7.2 GHz, and all three antennas operate with right-hand circularly polarized (RHCP) radiation. One of each of these antennas was mounted on the front of the probe facing the Sun, and one of each was mounted to the back of the probe facing away from the Sun. The space probe was powered by a two-panel gallium arsenide/germanium solar array providing an average of 450 watts while in Mercury orbit. Each panel was rotatable and included optical solar reflectors to balance the temperature of the array. Power was stored in a common-pressure-vessel, 23-ampere-hour nickel–hydrogen battery, with 11 vessels and two cells per vessel. The spacecraft's onboard computer system was contained in an Integrated Electronics Module (IEM), a device that combined core avionics into a single box. The computer featured two radiation-hardened IBM RAD6000s, a 25 megahertz main processor, and a 10 MHz fault protection processor. For redundancy, the spacecraft carried a pair of identical IEMs. For data storage, the spacecraft carried two solid-state recorders able to store up to one gigabyte each. The IBM RAD6000 main processor collected, compressed, and stored data from MESSENGER's instruments for later playback to Earth. 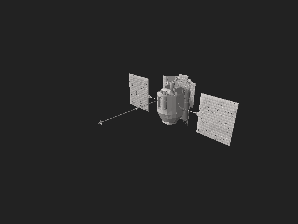 MESSENGER used a software suite called SciBox to simulate its orbit and instruments, in order to "choreograph the complicated process of maximizing the scientific return from the mission and minimizing conflicts between instrument observations, while at the same time meeting all spacecraft constraints on pointing, data downlink rates, and onboard data storage capacity." Included two CCD cameras, a narrow-angle camera (NAC) and a wide-angle camera (WAC) mounted to a pivoting platform. The camera system provided a complete map of the surface of Mercury at a resolution of 250 meters/pixel, and images of regions of geologic interest at 20–50 meters/pixel. Color imaging was possible only with the narrow-band filter wheel attached to the wide-angle camera. Acquisition of near-global coverage at ≈500-meters/pixel. A nadir-looking monochrome global photomosaic at moderate solar incidence angles (55°–75°) and 250-meters/pixel or better sampling resolution. Measured gamma-ray emissions from the surface of Mercury to determine the planet's composition by detecting certain elements (oxygen, silicon, sulfur, iron, hydrogen, potassium, thorium, uranium) to a depth of 10 cm. Determined the hydrogen mineral composition to a depth of 40 cm by detecting low-energy neutrons resulting from the collision of cosmic rays with the minerals. Mapped mineral composition within the top millimeter of the surface on Mercury by detecting X-ray spectral lines from magnesium, aluminum, sulphur, calcium, titanium, and iron, in the 1–10 keV range. Measured the magnetic field around Mercury in detail to determine the strength and average position of the field. Investigate the structure of Mercury's magnetic field and its interaction with the solar wind. Observe magnetotail dynamics, including phenomena possibly analogous to substorms in the Earth's magnetosphere. Detect and quantify the planet's forced physical librations by tracking the motion of large-scale topographic features as a function of time. Measure the surface reflectivity of Mercury at the MLA operating wavelength of 1,064 nanometers. Determined the characteristics of the tenuous atmosphere surrounding Mercury by measuring ultraviolet light emissions, and ascertained the prevalence of iron and titanium minerals on the surface by measuring the reflectance of infrared light. Measured the charged particles in the magnetosphere around Mercury using an energetic particle spectrometer (EPS) and the charged particles that come from the surface using a fast imaging plasma spectrometer (FIPS). Determine the composition of the radar-reflective materialmaterials gyms at Mercury's poles. Measured the gravity of Mercury and the state of the planetary core by utilizing the spacecraft's positioning data. Observe gravitational perturbations from Mercury to investigate the spatial variations of density within the planet's interior, and a time-varying component in Mercury's gravity to quantify the amplitude of Mercury's libration. The assembly of MESSENGER's solar panels by APL technicians. Technicians prepare MESSENGER for transfer to a hazardous processing facility. Attachment of the PAM to MESSENGER. The ceramic-cloth sunshade is prominent in this view. A suited worker looks over the hydrazine fuel supply to be loaded in MESSENGER. Energetic Particle Spectrometer begins Earth observations. Start MDIS color images of South America (set 1). Start MDIS color images of South America (set 2). Earth closest approach at 2,348 km. Start MDIS color imaging sequence of Amazon Basin. Start MDIS color image sequence for departure "movie". End MDIS color image sequence for departure "movie". Venus closest approach at 2,987 km. Venus closest approach at 313 km. First of eight Optical Navigation images taken on approach. Last of eight Optical Navigation images taken on approach. Start encounter imaging sequence, beacon-only tracking of probe begins. The MESSENGER probe was launched on August 3, 2004 at 06:15:56 UTC by NASA from Space Launch Complex 17B at the Cape Canaveral Air Force Station in Florida, aboard a Delta II 7925 launch vehicle. The complete burn sequence lasted 57 minutes bringing the spacecraft into a heliocentric orbit, with a final velocity of 10.68 km/s (6.64 miles/s) and sending the probe into a 7.9 billion-kilometer trajectory that took 6 years, 7 months and 16 days before its orbital insertion on March 18, 2011. Traveling to Mercury requires an extremely large velocity change (see delta-v) because Mercury's orbit is deep in the Sun's gravity well. On a direct course from Earth to Mercury, a spacecraft is constantly accelerated as it falls toward the Sun, and will arrive at Mercury with a velocity too high to achieve orbit without excessive use of fuel. For planets with an atmosphere, such as Venus and Mars, spacecraft can minimize their fuel consumption upon arrival by using friction with the atmosphere to enter orbit (aerocapture), or can briefly fire their rocket engines to enter into orbit followed by a reduction of the orbit by aerobraking. However, the tenuous atmosphere of Mercury is far too thin for these maneuvers. Instead, MESSENGER extensively used gravity assist maneuvers at Earth, Venus, and Mercury to reduce the speed relative to Mercury, then used its large rocket engine to enter into an elliptical orbit around the planet. The multi-flyby process greatly reduced the amount of propellant necessary to slow the spacecraft, but at the cost of prolonging the trip by many years and to a total distance of 4.9 billion miles. Several planned thruster firings en route to Mercury were unnecessary, because these fine course adjustments were performed using solar radiation pressure acting on MESSENGER's solar panels. To further minimize the amount of necessary propellant, the spacecraft orbital insertion targeted a highly elliptical orbit around Mercury. The elongated orbit had two other benefits: It allowed the spacecraft time to cool after the times it was between the hot surface of Mercury and the Sun, and also it allowed the spacecraft to measure the effects of solar wind and the magnetic fields of the planet at various distances while still allowing close-up measurements and photographs of the surface and exosphere. The launch of MESSENGER on a Delta II launch vehicle. Interplanetary trajectory of the MESSENGER orbiter. MESSENGER performed an Earth flyby one year after launch, on August 2, 2005, with the closest approach at 19:13 UTC at an altitude of 2,347 kilometers (1,458 statute miles) over central Mongolia. On December 12, 2005, a 524-second-long burn (Deep-Space Maneuver or DSM-1) of the large thruster adjusted the trajectory for the upcoming Venus flyby. During the Earth flyby, the MESSENGER team imaged the Earth and Moon using MDIS and checked the status of several other instruments observing the atmospheric and surface compositions and testing the magnetosphere and determining that all instruments tested were working as expected. This calibration period was intended to ensure accurate interpretation of data when the spacecraft entered orbit around Mercury. Ensuring that the instruments functioned correctly at such an early stage in the mission allowed opportunity for multiple minor errors to be dealt with. The Earth flyby was used to investigate the flyby anomaly, where some spacecraft have been observed to have trajectories that differ slightly from those predicted. However no anomaly was observed in MESSENGER's flyby. A view of Earth from MESSENGER during its Earth flyby. The Earth and Moon (lower left), captured by MESSENGER from a distance of 183 million kilometers. Earth flyby sequence captured on August 3, 2005 (Full-size video). On October 24, 2006 at 08:34 UTC, MESSENGER encountered Venus at an altitude of 2,992 kilometers (1,859 mi). During the encounter, MESSENGER passed behind Venus and entered superior conjunction, a period when Earth was on the exact opposite side of the Solar System, with the Sun inhibiting radio contact. For this reason, no scientific observations were conducted during the flyby. Communication with the spacecraft was reestablished in late November and performed a deep space maneuver on December 12, to correct the trajectory to encounter Venus in a second flyby. On June 5, 2007, at 23:08 UTC, MESSENGER performed a second flyby of Venus at an altitude of 338 km (210 mi), for the greatest velocity reduction of the mission. During the encounter, all instruments were used to observe Venus and prepare for the following Mercury encounters. The encounter provided visible and near-infrared imaging data of the upper atmosphere of Venus. Ultraviolet and X-ray spectrometry of the upper atmosphere were also recorded, to characterize the composition. The ESA's Venus Express was also orbiting during the encounter, providing the first opportunity for simultaneous measurement of particle-and-field characteristics of the planet. Venus imaged by MESSENGER on its first flyby of the planet in 2006. Venus imaged by MESSENGER on its second flyby of the planet in 2007. A more detailed image of Venus MESSENGER on the second flyby of the planet. Sequence of images as MESSENGER departs after the second flyby of the planet. MESSENGER made a flyby of Mercury on January 14, 2008 (making its closest approach of 200 km above the surface of Mercury at 19:04:39 UTC), followed by a second flyby on October 6, 2008. MESSENGER executed a final flyby on September 29, 2009, further slowing down the spacecraft. Sometime during the closest approach of the last flyby, the spacecraft entered safe mode. Although this had no effect on the trajectory necessary for later orbit insertion, it resulted in the loss of science data and images that were planned for the outbound leg of the fly-by. The spacecraft had fully recovered by about seven hours later. One last deep space maneuver, DSM-5, was executed on November 24, 2009, at 22:45 UTC to provide the required velocity change for the scheduled Mercury orbit insertion on March 18, 2011, marking the beginning of the orbital mission. The first high-resolution color Wide Angle Camera image of Mercury acquired by MESSENGER. Smooth plains on Mercury imaged by MESSENGER during the third flyby of the planet. An image of part of the previously unseen side of the planet. Lava-flooded craters and large expanses of smooth volcanic plains on Mercury. The thruster maneuver to insert the probe into Mercury's orbit began at 00:45 UTC on March 18, 2011. The maneuver lasted about 15 minutes, with confirmation that the craft was in Mercury orbit received at 01:10 UTC on March 18 (9:10 PM, March 17 EDT). Mission lead engineer Eric Finnegan indicated that the spacecraft had achieved a near-perfect orbit. MESSENGER's orbit was highly elliptical, taking it within 200 kilometers (120 mi) of Mercury's surface and then 15,000 km (9,300 mi) away from it every twelve hours. This orbit was chosen to shield the probe from the heat radiated by Mercury's hot surface. Only a small portion of each orbit was at a low altitude, where the spacecraft was subjected to radiative heating from the hot side of the planet. Charles Bolden and colleagues wait for news from the MESSENGER probe. Charles Bolden congratulates Eric Finnegan following the successful orbital insertion. The first-ever photograph from Mercury orbit, taken by MESSENGER on March 29, 2011. A simplified chart showing the path of MESSENGER's orbital insertion. After MESSENGER's orbital insertion, an eighteen-day commissioning phase took place. The supervising personnel switched on and tested the craft's science instruments to ensure they had completed the journey without damage. The commissioning phase "demonstrated that the spacecraft and payload [were] all operating nominally, notwithstanding Mercury's challenging environment." The primary mission began as planned on April 4, 2011, with MESSENGER orbiting Mercury once every twelve hours for an intended duration of twelve Earth months, the equivalent of two solar days on Mercury. Principal Investigator Sean Solomon, then of the Carnegie Institution of Washington, said: "With the beginning today of the primary science phase of the mission, we will be making nearly continuous observations that will allow us to gain the first global perspective on the innermost planet. Moreover, as solar activity steadily increases, we will have a front-row seat on the most dynamic magnetosphere–atmosphere system in the Solar System." On October 5, 2011, the scientific results obtained by MESSENGER during its first six terrestrial months in Mercury's orbit were presented in a series of papers at the European Planetary Science Congress in Nantes, France. Among the discoveries presented were the unexpectedly high concentrations of magnesium and calcium found on Mercury's nightside, and the fact that Mercury's magnetic field is offset far to the north of the planet's center. A monochrome image of Mercury from MESSENGER. Crater Stevenson, with two perpendicular secondary crater chains running through its center. A south polar projection of Mercury. A close snapshot of ridges near Mercury's south pole. A MESSENGER image of Mercury shows previously undetected fault scarps— cliff-like landforms resembling stairs that are small enough that scientists believe they are geologically young. This shows that Mercury is still contracting, and that Earth is not the only tectonically active Solar System planet. In November 2011, NASA announced that the MESSENGER mission would be extended by one year, allowing the spacecraft to observe the 2012 solar maximum. Its extended mission began on March 17, 2012, and continued until March 17, 2013. Between April 16 and April 20, 2012, MESSENGER carried out a series of thruster manoeuvres, placing it in an eight-hour orbit to conduct further scans of Mercury. In November 2012, NASA reported that MESSENGER had discovered both water ice and organic compounds in permanently shadowed craters in Mercury's north pole. In February 2013, NASA published the most detailed and accurate 3D map of Mercury to date, assembled from thousands of images taken by MESSENGER. MESSENGER completed its first extended mission on March 17, 2013, and its second lasted until April 2015. In November 2013, MESSENGER was among the numerous space assets that imaged Comet Encke (2P/Encke) and Comet ISON (C/2012 S1). As its orbit began to decay in early 2015, MESSENGER was able to take highly detailed close-up photographs of ice-filled craters and other landforms at Mercury's north pole. After the mission was completed, review of the radio ranging data provided the first measurement of the rate of mass loss from the Sun. False-color map showing maximum temperatures of north polar region. Crater Apollodorus, with the Pantheon Fossae radiating from it. Crater rays streaking across the planet's southern hemisphere. Surface hollows in the wall of crater Sholem Aleichem. Perspective view of Caloris Basin – high (red); low (blue). On July 3, 2008, the MESSENGER team announced that the probe had discovered large amounts of water present in Mercury's exosphere, which was an unexpected finding. In the later years of its mission, MESSENGER also provided visual evidence of past volcanic activity on the surface of Mercury, as well as evidence for a liquid iron planetary core. 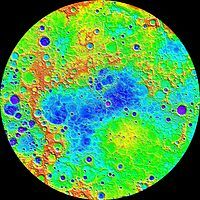 The probe also constructed the most detailed and accurate maps of Mercury to date, and furthermore discovered carbon-containing organic compounds and water ice inside permanently shadowed craters near the north pole. Mass concentrations (red; Caloris Basin at center, Sobkou Planitia at right), detected via gravity anomalies, provide evidence for subsurface structure and evolution. Northern hemisphere topography from MLA data shows a 10 km vertical range: high (red); low (purple). MASCS spectral scan of Mercury's surface. On February 18, 2011, a portrait of the Solar System was published on the MESSENGER website. The mosaic contained 34 images, acquired by the MDIS instrument during November 2010. All the planets were visible with the exception of Uranus and Neptune, due to their vast distances from the Sun. The MESSENGER "family portrait" was intended to be complementary to the Voyager family portrait, which was acquired from the outer Solar System by Voyager 1 on February 14, 1990. MESSENGER captured a near-complete portrait of the Solar System during November 2010. After running out of propellant for course adjustments, MESSENGER entered its expected terminal phase of orbital decay in late 2014. The spacecraft's operation was extended by several weeks by exploiting its remaining supply of helium gas, which was used to pressurize its propellant tanks, as reaction mass. MESSENGER continued studying Mercury during its decay period. The spacecraft crashed onto the surface of Mercury on April 30, 2015, at 3:26 p.m. EDT (19:26 GMT), at a velocity of 14,080 km/h (8,750 mph), probably creating a crater in the planet's surface approximately 16 m (52 ft) wide. The spacecraft was estimated to have impacted at 54.4° N, 149.9° W on Suisei Planitia, near the crater Janáček. The crash occurred on the side of the planet not visible from Earth, and thus was not detected by any observers or instruments. NASA confirmed the end of the MESSENGER mission at 3:40 p.m. EDT (19:40 GMT) after NASA's Deep Space Network failed to detect the spacecraft's reemergence from behind Mercury. MESSENGER's first (March 29, 2011) and last (April 30, 2015) images from Mercury's orbit (impact details). ^ a b "NASA extends spacecraft's Mercury mission". UPI. November 15, 2011. Retrieved December 20, 2012. ^ a b c d e "MESSENGER Completes Its First Extended Mission at Mercury". JHU – APL. March 18, 2013. Archived from the original on July 29, 2013. Retrieved July 8, 2013. ^ a b Wu, Brian (April 3, 2015). "NASA Set to Extend Mercury Mission for Another Month". Johns Hopkins University APL. The Science Times. Retrieved April 4, 2015. 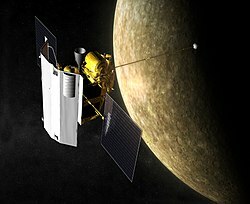 ^ "MESSENGER's Operations at Mercury Extended". Johns Hopkins University APL. SpaceRef.com. April 3, 2015. Retrieved April 4, 2015. ^ Lee, Jimmy; Galuska, Mike (March 18, 2011). "NASA Chats – MESSENGER Prepares to Orbit Mercury". NASA. Archived from the original on June 7, 2011. Retrieved March 18, 2011. ^ a b "NASA Spacecraft Circling Mercury". The New York Times. March 17, 2011. Retrieved July 9, 2013. ^ Wendel, J. (April 2015). "Mercury's secrets revealed by soon-to-crash spacecraft". Eos. 96. doi:10.1029/2015EO029165. ^ a b "Countdown to MESSENGER's Closest Approach with Mercury" (Press release). Johns Hopkins University. January 14, 2008. Archived from the original on May 13, 2013. Retrieved May 1, 2009. ^ a b "Critical Deep-Space Maneuver Targets MESSENGER for Its Second Mercury Encounter" (Press release). Johns Hopkins University. March 19, 2008. Archived from the original on May 13, 2013. Retrieved April 20, 2010. ^ a b "Deep-Space Maneuver Positions MESSENGER for Third Mercury Encounter" (Press release). Johns Hopkins University. December 4, 2008. Archived from the original on May 13, 2013. Retrieved April 20, 2010. ^ Corum, Jonathan (April 30, 2015). "Messenger's Collision Course With Mercury". The New York Times. Retrieved April 30, 2015. ^ "From Mercury orbit, MESSENGER watches a lunar eclipse". Planetary Society. October 10, 2014. Retrieved January 23, 2015. ^ a b "Messenger's Mercury trip ends with a bang, and silence". BBC News. April 30, 2015. Retrieved May 2, 2015. ^ a b "MESSENGER Surpasses 200,000 Orbital Images of Mercury". JHU – APL. February 6, 2014. Archived from the original on April 15, 2014. Retrieved April 14, 2014. ^ a b c "MESSENGER Team Presents New Mercury Findings at Planetary Conference" Archived 2013-05-13 at the Wayback Machine. Johns Hopkins University Applied Physics Laboratory. October 5, 2011. Retrieved November 23, 2011. ^ a b "NASA probe reveals organics, ice on Mercury". Reuters. November 29, 2012. Retrieved November 29, 2012. ^ Rincon, Paul (October 16, 2014). "Mercury's hidden water-ice revealed". BBC News. Retrieved October 17, 2014. ^ Harmon, J. K.; Slade, M. A.; Vélez, R. A.; Crespo, A.; Dryer, M. J.; Johnson, J. M. (1994). "Radar mapping of Mercury's polar anomalies". Nature. 369 (6477): 213–215. Bibcode:1994Natur.369..213H. doi:10.1038/369213a0. ISSN 0028-0836. ^ Malik, Tariq (August 16, 2004). "MESSENGER to test theory of shrinking Mercury". USA Today. Retrieved May 23, 2012. ^ "Finally! NASA Prepares to Orbit Mercury". Science NASA. NASA. Retrieved 26 March 2018. ^ McAdams, J. V.; J. L. Horsewood; C. L. Yen (August 10–12, 1998). "Discovery-class Mercury orbiter trajectory design for the 2005 launch opportunity" (PDF). 1998 Astrodynamics Specialist Conference. Boston, MA: American Institute of Aeronautics and Astronautics/American Astronautical Society: 109–115. AIAA-98-4283. Archived from the original (PDF) on 2013-05-13. ^ "MESSENGER – Mission description". NASA. Retrieved July 8, 2013. ^ a b c d e f g h "MESSENGER NASA's Mission to Mercury Launch Press Kit" (PDF) (Press release). NASA / JHUAPL. August 2004. Archived from the original (PDF) on August 24, 2007. Retrieved February 19, 2011. ^ "10 Surprising Facts About NASA's Mercury Probe". Space.com. March 16, 2011. Retrieved May 1, 2015. ^ "MESSENGER Completes Primary Mission at Mercury, Settles in for Another Year" (Press release). Johns Hopkins University. March 19, 2012. Archived from the original on May 13, 2013. Retrieved April 10, 2012. ^ "The Medium-gain Antenna of the MESSENGER Spacecraft". Microwave Journal. October 1, 2005. Archived from the original on November 1, 2010. Retrieved March 19, 2011. ^ a b c d "MESSENGER Kicks Off Yearlong Campaign of Mercury Science" Archived 2013-04-12 at the Wayback Machine. JHU – APL. April 4, 2011. Retrieved November 23, 2011. ^ a b Hawkins, S. Edward; John D. Boldt; Edward H. Darlington; Raymond Espiritu; Robert E. Gold; Bruce Gotwols; Matthew P. Grey; Christopher D. Hash; John R. Hayes; Steven E. Jaskulek; et al. (August 1, 2007). "The Mercury Dual Imaging System on the MESSENGER spacecraft". Space Science Reviews. 131: 247–338. Bibcode:2007SSRv..131..247H. doi:10.1007/s11214-007-9266-3. ^ "Mercury Dual Imaging System (MDIS)". NASA/National Space Science Data Center. Retrieved February 19, 2011. ^ Hash, Christopher; Raymond Espiritu; Erick Malaret; Louise Prockter; Scott Murchie; Alan Mick; Jennifer Ward (2007). "MESSENGER Mercury Dual Imaging System (MDIS) Experimental Data Record (EDR) Software Interface Specification (SIS)" (PDF). Archived from the original (PDF) on 2011-07-21. ^ a b c d Goldsten, John O.; Edgar A. Rhodes; William V. Boynton; William C. Feldman; David J. Lawrence; Jacob I. Trombka; David M. Smith; Larry G. Evans; Jack White; Norman W. Madden; et al. (November 8, 2007). "The MESSENGER Gamma-Ray and Neutron Spectrometer". Space Science Reviews. 131: 339–391. Bibcode:2007SSRv..131..339G. doi:10.1007/s11214-007-9262-7. ^ a b "Gamma-Ray and Neutron Spectrometer (GRNS)". NASA / National Space Science Data Center. Retrieved 2011-02-19. ^ a b Schlemm, Charles; Richard D. Starr; George C. Ho; Kathryn E. Bechtold; Sarah A. Hamilton; John D. Boldt; William V. Boynton; Walter Bradley; Martin E. Fraeman; Robert E. Gold; et al. (2007). "The X-Ray Spectrometer on the MESSENGER Spacecraft". Space Science Reviews. 131 (1): 393–415. Bibcode:2007SSRv..131..393S. doi:10.1007/s11214-007-9248-5. ^ "X-ray Spectrometer (XRS)". NASA / National Space Science Data Center. Retrieved 2011-02-19. ^ a b Anderson, Brian J.; Mario H. Acuña; David A. Lohr; John Scheifele; Asseem Raval; Haje Korth & James A. Slavin (2007). "The Magnetometer Instrument on MESSENGER". Space Science Reviews. 131 (1): 417–450. Bibcode:2007SSRv..131..417A. doi:10.1007/s11214-007-9246-7. ^ "Magnetometer (MAG)". NASA / National Space Science Data Center. Retrieved 2011-02-19. ^ a b Cavanaugh, John F.; James C. Smith; Xiaoli Sun; Arlin E. Bartels; Luis Ramos-Izquierdo; Danny J. Krebs; Jan F. McGarry; Raymond Trunzo; Anne Marie Novo-Gradac; Jamie L. Britt; et al. (2007). "The Mercury Laser Altimeter Instrument for the MESSENGER Mission". Space Science Reviews. 131 (1): 451–479. Bibcode:2007SSRv..131..451C. doi:10.1007/s11214-007-9273-4. ^ "Mercury Laser Altimeter (MLA)". NASA / National Space Science Data Center. Retrieved 2011-02-19. ^ a b McClintock, William; Mark Lankton (2007). "The Mercury Atmospheric and Surface Composition Spectrometer for the MESSENGER Mission". Space Science Reviews. 131 (1): 481–521. Bibcode:2007SSRv..131..481M. doi:10.1007/s11214-007-9264-5. ^ "Mercury Atmospheric and Surface Composition Spectrometer (MASCS)". NASA / National Space Science Data Center. Retrieved 2011-02-19. ^ a b Andrews, G. Bruce; Thomas H. Zurbuchen; Barry H. Mauk; Horace Malcom; Lennard A. Fisk; George Gloeckler; George C. Ho; Jeffrey S. Kelley; Patrick L. Koehn; Thomas W. LeFevere; et al. (2007). "The Energetic Particle and Plasma Spectrometer Instrument on the MESSENGER Spacecraft". Space Science Reviews. 131 (1): 523–556. Bibcode:2007SSRv..131..523A. doi:10.1007/s11214-007-9272-5. ^ "Energetic Particle and Plasma Spectrometer (EPPS)". NASA / National Space Science Data Center. Retrieved February 19, 2011. ^ "Radio Science (RS)". NASA / National Space Science Data Center. Retrieved 2011-02-19. ^ a b Srinivasan, Dipak K.; Mark E. Perry; Karl B. Fielhauer; David E. Smith; Maria T. Zuber (2007). "The Radio Frequency Subsystem and Radio Science on the MESSENGER Mission". Space Science Reviews. 131 (1): 557–571. Bibcode:2007SSRv..131..557S. doi:10.1007/s11214-007-9270-7. ^ Chang, Kenneth (April 27, 2015). "NASA's Messenger Mission Is Set to Crash Into Mercury". The New York Times. Retrieved April 27, 2015. ^ "Earth Flyby Timeline". JHU/APL. August 2, 2005. Archived from the original on May 13, 2013. Retrieved January 24, 2011. ^ "Mercury Flyby 1" (PDF) (Press release). JHU/APL. January 14, 2008. Archived from the original (PDF) on May 13, 2013. Retrieved January 24, 2011. ^ "Mercury Flyby 2" (PDF) (Press release). JHU/APL. October 6, 2008. Archived from the original (PDF) on May 13, 2013. Retrieved January 24, 2011. ^ "Mercury Flyby 3" (PDF) (Press release). JHU/APL. September 29, 2009. Archived from the original (PDF) on May 13, 2013. Retrieved January 24, 2011. ^ a b "MESSENGER Begins Historic Orbit around Mercury" (Press release). NASA/APL. March 17, 2011. Archived from the original on April 12, 2013. Retrieved March 18, 2011. ^ "MESSENGER Sails on Sun's Fire for Second Flyby of Mercury". 2008-09-05. Archived from the original on 2013-05-14. ^ "MESSENGER Engine Burn Puts Spacecraft on Track for Venus" (Press release). Johns Hopkins University. December 12, 2005. Retrieved May 1, 2009. ^ "MESSENGER Status Report" (Press release). NASA/APL. August 26, 2005. Archived from the original on May 13, 2013. Retrieved March 17, 2011. ^ "MESSENGER Completes Venus Flyby" (Press release). NASA/APL. October 24, 2006. Archived from the original on May 13, 2013. Retrieved 2011-03-17. ^ "Critical Deep-Space Maneuver Targets MESSENGER for Its First Mercury Encounter" (Press release). Johns Hopkins University. October 17, 2007. Archived from the original on December 1, 2008. Retrieved 2009-05-01. ^ "MESSENGER Gains Critical Gravity Assist for Mercury Orbital Observations". MESSENGER Mission News. September 30, 2009. Archived from the original on May 10, 2013. Retrieved September 30, 2009. ^ "Deep-Space Maneuver Positions MESSENGER for Mercury Orbit Insertion" (Press release). Johns Hopkins University. November 24, 2009. Archived from the original on May 13, 2013. Retrieved April 20, 2010. ^ Roylance, Frank (March 17, 2011). "Messenger successfully goes into orbit around Mercury". Baltimore Sun. Retrieved March 18, 2011. ^ Cowen, Ron (March 17, 2011). "MESSENGER eases into Mercury's orbit". Science News. Retrieved March 18, 2011. ^ "MESSENGER Mercury Orbit Insertion" (PDF) (Press release). NASA/APL. March 18, 2011. Archived from the original (PDF) on May 13, 2013. Retrieved March 17, 2011. ^ "Messenger settles into new orbit to probe Mercury" Archived 2012-04-26 at the Wayback Machine. Wired UK. April 24, 2012. Retrieved April 29, 2012. ^ "Mercury's water ice at north pole finally proven". BBC. November 30, 2012. Retrieved November 30, 2012. ^ "New Nasa Photos Show Off Mercury In Brilliant 3D Map (VIDEO)". Huffington Post. February 16, 2013. Retrieved February 16, 2013. 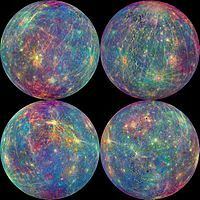 ^ "Mercury shows off its colourful side". BBC. February 16, 2013. Retrieved February 16, 2013. ^ "MESSENGER Detects Comets ISON and Encke, Prepares for Closer Encounters". USRA.edu. November 15, 2013. Retrieved January 23, 2015. ^ Staff (December 6, 2013). "How NASA Space Assets Observed Comet ISON". NASA. Retrieved May 11, 2014. ^ Sekanina, Zdenek; Kracht, Rainer (May 8, 2014). "Disintegration of Comet C/2012 S1 (ISON) Shortly Before Perihelion: Evidence From Independent Data Sets". arXiv:1404.5968. ^ "Best views yet of Mercury's ice-filled craters". BBC News. March 17, 2015. Retrieved March 18, 2015. ^ "High-resolution Hollows". MESSENGER Featured Images. JHU - APL. 2014-03-12. Archived from the original on 2014-03-14. ^ Lakdawalla, E. (2014-02-18). "What are Mercury's hollows?". Planetary Society. Retrieved 2015-05-01. ^ a b Lakdawalla, Emily (July 3, 2008). "MESSENGER Scientists 'Astonished' to Find Water in Mercury's Thin Atmosphere". The Planetary Society. Archived from the original on July 7, 2008. Retrieved May 1, 2009. ^ Head, James W.; Chapman, Clark R.; Strom, Robert G.; Fassett1,, Caleb I.; Denevi, Brett W. (30 September 2011). "Flood Volcanism in the Northern High Latitudes of Mercury Revealed by MESSENGER". Science. 333 (6051): 1853–1856. Bibcode:2011Sci...333.1853H. doi:10.1126/science.1211997. PMID 21960625. Retrieved April 4, 2015. ^ Wall, Mike (March 29, 2015). "NASA Mercury Probe Trying to Survive for Another Month". Space.com. Retrieved April 4, 2015. ^ "A Solar System Family Portrait, from the Inside Out" (Press release). APL. February 18, 2011. Archived from the original on May 12, 2013. Retrieved February 18, 2011. ^ "Innovative use of pressurant extends MESSENGER's Mercury mission". Astronomy.com. December 29, 2014. Retrieved January 22, 2015. ^ a b "Farewell, MESSENGER! NASA Probe Crashes Into Mercury". Space.com. April 30, 2015. Retrieved May 2, 2015. ^ "Mercury Messenger Mission Ends with a Smashing Finale". Universe Today. April 30, 2015. Retrieved May 2, 2015. ^ "Press Release: NASA Completes MESSENGER Mission with Expected Impact on Mercury's Surface". NASA. April 30, 2015. Retrieved May 2, 2015. Wikimedia Commons has media related to MESSENGER.